City officials celebrated new brick-trimmed crosswalks and sidewalk bulb-outs on 24th Street in Noe Valley at a ribbon-cutting ceremony today. The changes will make for a more pedestrian- and transit-friendly environment on Noe Valley’s commercial corridor. At Castro and Noe Streets, the transit bulb-outs — curb extensions at bus stops — will help speed up Muni’s 24 and 48 lines. Completion of the “24th Street Urban Village” project, led by the Department of Public Works, was delayed from last fall. The project also includes new benches and planters on the bulb-outs, and was paid for with $560,000 from the $248 million street re-paving bond passed by voters in 2011. While 24th isn’t especially dangerous, the sidewalk extensions and crosswalks should help protect pedestrians from impatient drivers. At a recent community forum on traffic issues in Noe Valley, a woman complained about “young people who come to the curb and just keep going” at stops signs, where they have the right-of-way. By next October, a parking lot on 25th east of Sanchez Street is set to be transformed into a public plaza. The final $600,000 needed to construct the Noe Valley Town Square was approved as part of the city budget last month, thanks to a push from Wiener to allocate funding from a state parks grant. 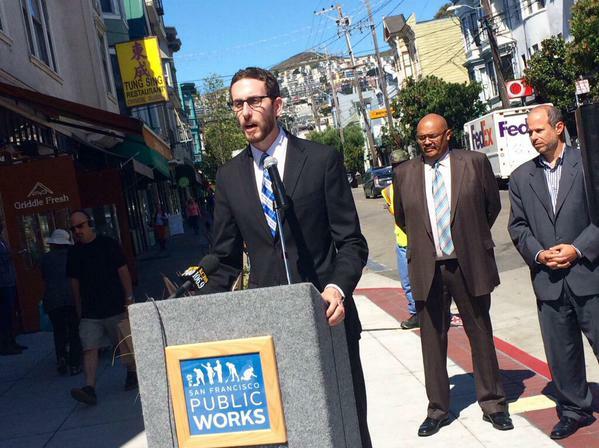 Wiener also plans to keep 24th’s sidewalks clear of cars and driveway ramps by opposing any curb cuts for new developments, he told the SF Chronicle in April. The parking lot conversion and bulb-outs were conceived as a fallback plan to create more public space on 24th after some neighbors shouted down a proposal to convert a block of Noe at 24th into a pedestrian plaza. I’m talking about crosswalks in upscale residential areas like Noe Valley, where runaway entitlement is off the charts. Adult men and women – mothers pushing their precious cargo in baby strollers or holding the little tykes by the hand – arrogantly step off curbs without bothering to check traffic. Once in the crosswalk, they saunter as if checking out the goods at a village bazaar. One bulbout is usually about $100,000-$150,000. Brick is a Windows Paint pattern, it hardly qualifies as “decorative”. 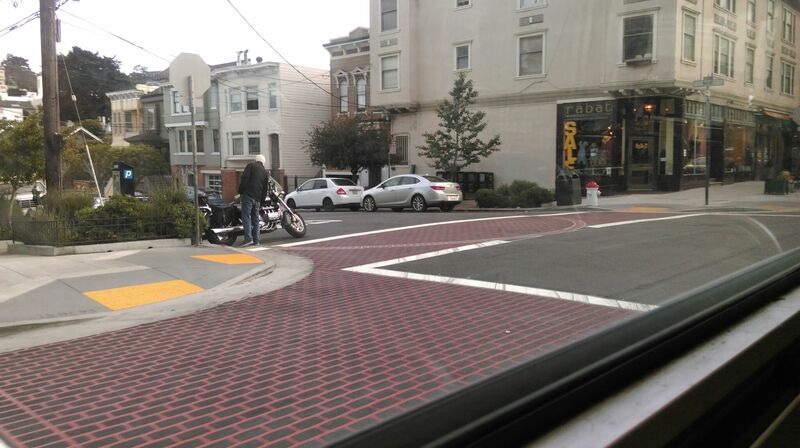 Fruitvale and Chinatown in Oakland have decorative crosswalks. So nice to see bulb-outs activated with benches and planter boxes. Makes a huge difference compared with the transit bulbs at Carl & Cole, for instance. And really digging the brick curb edge that started around Upper Market and is now travelling outside the neighborhood . . . Anything beside gray concrete is an improvement. I’m going to celebrate by going to my bank on 24th Street and closing my account. When they ask why I’m closing my account I’m going to tell them that it is too hard to do business in Noe Valley. Well, when you insist on paying costs with nickels and dimes, why do you expect people to like you as a customer? I don’t understand why they are red. Really hard to see at night. 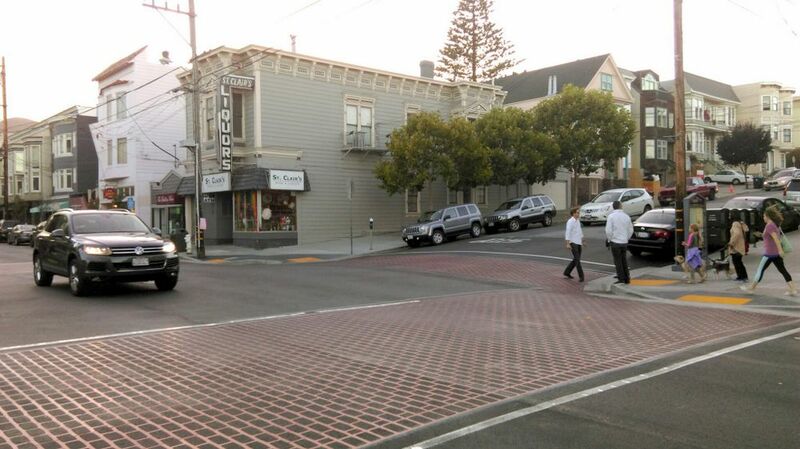 Liked the white brick on Castro and 24th much better before. It’s better than nothing. But could have been brighter. So… crosswalks make it hard to do business? What excellent reasoning skills you possess. Hey, it’s been a while since I’ve seen a gun on the streets in Dogpatch! Thanks for the reminder!